What is Foot Drop Brace? A Foot Drop Brace is a rigid or flexible support that offers dynamic or static assistance to the weakened foot so functional mobility and exercises can be possible. 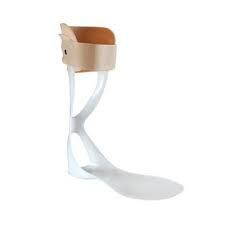 AFO Leaf Spring is a pre-fabricated polypropylene ankle-foot orthosis designed to support flaccid drop foot. It provides a semirigid section for toe clearance and support, yet has a thin, flexible foot plate for easy trimming. The absence of a heel section makes the Leaf Spring more comfortable to wear and provides a better fit in shoes. How Do I Write a Great Review? The best NeuroRehab Directory Reviews include not only whether you liked or disliked a product, but also why. Great reviews are typically helpful and describe a personal experience you have had with certain product. A good rule of thumb might be to ask yourself, “Would I find this review useful?” We welcome your honest opinion about the product. We do not remove reviews because they are critical, as we believe all helpful information can be informative. What Should I Avoid in my Review? NeuroRehab Directory proudly represents itself as a non-biased website, therefore, we do not allow users to review products that they own or with which they are otherwise affiliated. Reviews may not contain obscenities, profanity, phone numbers, mailing addresses, URLs, foreign language content (unless there is a clear connection to the product). We don’t allow reviews that express intolerance for people belonging to identity groups including race, gender, religion, sexual preference, or nationality. Customers are allowed to comment on products as long as it is in a non-threatening manner. Can I Write a Negative Review? Yes. Both positive and negative experiences can be helpful to other consumers so long as your reviews are honest and provide as many of the relevant details as possible. Make sure your review is factually correct. Feel free to air your opinions, but don’t exaggerate or misrepresent your experience. Your opinions are generally protected, but posting false or disparaging comments can have legal consequences. When consumers review rehab products they’ve used, other consumers benefit from their experience and can take their feedback into consideration when searching. Manufactures can utilize the consumer data to improve their products or services. When they improve negatively reviewed features or add upgrades, consumers can provide new reviews. Limiting reviews to only positive feedback reduces the benefits of to both the consumer and the manufacture. My Rehab Product Received a Bad Review, What Can I Do? All products receive a bad review periodically. Many product companies have a mixture of poor, fair and good reviews. If you are affiliated with a product and would like to respond to a review, please email info@neurorehabdirectory.com. At Össur, we pride ourselves on continuously pushing the boundaries to create some of the most effective, non-invasive mobility solutions on the market today. True advocates of “Life Without Limitations’’, our focus is on Prosthetic, Osteoarthritis and Injury Solutions. Use the form below to contact this manufacturer about this product. Please contact me regarding this product. Copyright NeuroRehab Directory 2019. All Rights Reserved. NeuroRehab Directory does not endorse any products found on this website.